Should You Pay to Have Your Kitchen or Bath Designed? 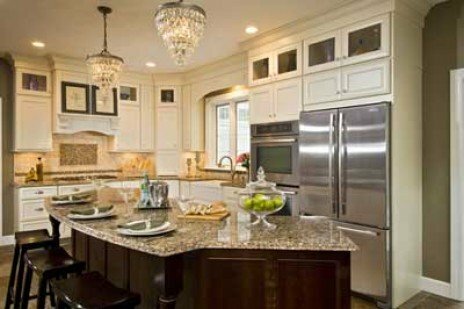 As you begin your journey to a beautiful new kitchen or bath, you will probably visit stores that showcase a wide variety of products and services. Some will offer free design or layout services while many will offer a combination of free and fee based consultation and design services. Other firms will seek a project retainer before making a serious commitment to your project. Should you consider an up front payment for services that can be had for free. To provide an analogy to fee based vs. free services, I would like to use the comparison of free over the air television to cable or satellite service. If you can satisfy your needs with fewer choices and limited services often providing a less than appealing experience, you may be able to save an up-front fee. Its rare to find a short-order cook that can provide the same culinary delight as an experienced and well-educated chef. You will find the same difference between the lumberyard employee and the seasoned interior designer that is connected to an experienced group of decorators and installation professionals. But, lets be fair, sometimes all were looking for is a good hot dog! Rule of thumb! If your just looking to replace what you have in roughly the same location that it now exists and you are armed with plans, measurements and component sizes, you probably do not need to pay a fee. You will probably want to take advantage of the super savings on our moderately priced products. But, if you are looking to make a real difference in the way your home looks and performs, you really need an in-home consultation with a professional. Given the amount of time expended in face-to-face visits, design work and research, fees and retainers insure that those services are not squandered. More often than not, the upfront fee will be applied against the final cost of your purchase. Before paying an up front fee, it may be wise to interview different designers to insure an ideological fit. Find a firm that features products and services compatible with your taste and needs. You will know it, when the feeling is right. And more often than not, you will get out of the relationship what you invest! KITCHEN & BATH WORLD, INC. provides many fee and non-fee services, we will be happy to consult with you concerning the type that may suit your needs most appropriately.